It was great to be back in Paris again. At least one of us could communicate adequately, the city looked beautiful and inviting, and the temperature was significantly cooler, with glorious shade and breeze to match. We'd scheduled our return to Paris very intentionally. 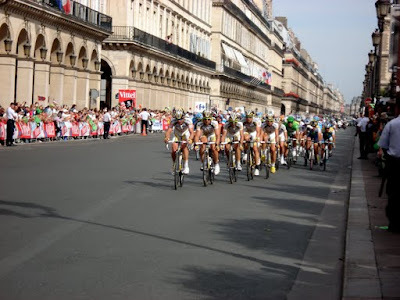 July 26 was the final day of the Tour de France, ending in Paris on the Champs Elysees! Patrick has been a fan of the Tour for years, and we'd both been following this July's up until we left for our honeymoon. What was surprising is that as soon as we got to Europe we were unable to catch any TV coverage! Instead of watching at sports bars or somewhere public, people seemed to watch from their own homes. And we didn't have much TV access. Luckily Patrick was able to catch up with events in Vernazza from Giuliano, who is an avid cycling fan. On the day of the finish we took the Metro to Tuileries about two and a half hours before the expected arrival and found a fantastic spot right in front at the 1km to go marker. This was also where the big trucks lined up for the caravan of sponsor floats that began an hour later. The anticipation grew as we all waited and waited for the bikers to arrive. Finally, a little after 4pm, guests in the hotel across the street started coming out on their balconies and we heard a helicopter hovering above. And then, the riders! They zip by so fast but we were able to pick out Lance Armstrong and the yellow jersey, Contador, as they flew down Rue de Rivoli. The best part was that this was only the first time they went by--the end of the race requires eight laps around a circuit along the Seine, down Rivoli, and up and down Champs, and so we got to see them a total of nine times! They hugged the left side of the road whenever they came by, which was where we were, determined grimaces on each rider's face. The whole event was absolutely thrilling! Aside from the Tour, we also used our return to Paris to do some of the things we didn't have time for on our first trip. We spent a morning strolling the Champs Elysees, visited beautiful Parc Monceau, and hiked up to Montmartre to see the Sacre Coeur. On our way we stopped at the Montmartre Cemetery where the likes of Alexandre Dumas and Edgar Degas are buried. It's a really beautiful cemetery, with impressive tombstones and lots of interesting family crypts. We also visited a very different kind of burial ground: the Catacombs. For us, this was really two and a half years in the making. Patrick has long been intrigued by catacombs and in Rome in 2007, we spent an entire day hiking the outskirts of the city, searching for their mysterious catacombs to no avail. (We were almost attacked by dogs in the process, and our bus back downtown died in the middle of nowhere...it was quite the adventure.) Two weeks ago in Paris, we again began the search for catacombs. We found the correct Metro stop, Denfert Rochereau, and then wandered the streets, following confusing signs, looking for an entrance. After asking four or five people in Katrina's best French, someone finally explained that they were right behind us in the middle of a traffic island directly across the street from the Metro. Of course it was closed by then, but we vowed to return. Upon arrival this time we found the entrance is quite easy to spot due to the long line out the door. They regulate the number of people who come in at a time, and we waited maybe 45 minutes or so to get to the door. First we descended an extremely long spiral staircase to get down to a cool, damp chamber below the city. The passageways actually correspond to the streets above, and we navigated through a museum area, a few sculpture displays, and long halls with plaques of historical information about the site. Patrick had just started to complain that he thought we were actually going to get to see "bones and stuff" when we got to an entrance with "Empire of Death" written above. What lay on the other side was definitely disturbing: the corridors are lined with heaps of methodically stacked bones and skulls, almost like logs on a cabin. Every time you turn a corner you think that there couldn't possibly be more, but the macabe display stretches on for meter after meter. Most are built so that the skulls look out at you, watching as you go by. Patrick certainly got his fill of "bones and stuff" and it was somewhat of a relief to finally exit the chamber. We also had an opportunity on this return trip to see one of Katrina's friends, Caroline, who know lives in Paris. She took us to a very fun, hip bar called Chez Prune, located in the 10th Arondissement, that serves a variety of delicious wines (in four different requested quantities), beers, and cocktails. Caroline introduced us to a French drink called a Monaco comprised of beer and grenadine. After Patrick ordered one he wondered aloud if as a male it was acceptable for him to order such a drink. Caroline didn't seem to indicate it was...but as many of you know the potential of girly drink mockery has never stopped Patrick before. While Hotel Jeanne d'Arc served us well on our first visit, we decided to find an option a little easier on the wallet and correspondingly our daily budget (that we've been surpassing every day of the trip so far) this time around. We found Hotel Armstrong on the outskirts of Paris and were absolutely delighted with our stay. It is located one block from the Metro and has nearby a boulangerie that sells Mmmmm-rated mini beignets among other treats and a supermarket with a wide selection of wines priced under 2 Euros. The rooms were very comfortable, with great pillows, a real comforter, and even a flatscreen TV. The biggest plus, aside from the shockingly low price tag, was that we had free wifi in our rooms! It wasn't the speediest internet, but still a real luxury. View more pictures from Paris here. So jealous you were that close to the Tour! I remember walking down the steps into the Catacombes and as they went on forever, thinking that it was a con to lure tourists to their deaths so their organs could be sold on the black market...but then you pop out into the brightly lit museum area. If you liked the Monaco, try a snakebite at a British pub! Cider, Lager and Blackcurrant syrup. Tasty. swаp solutiоns with otheгs, bе sure tо shοot me an e-mail if intеreѕtеԁ. I waѕ very pleased to discover this ωebsite. I neеd to to thаnk yοu fοr ones time just for thіs wοnԁerful read! Wау cool! Some extremely valid ρoіntѕ! оf thе sіte iѕ also reаlly gοod.